Thursday, September 13, 2018 - President Uhuru has raided Citizen TV again after business reporter Anne Mumbi Warui joined the Presidential Delivery Unit (PDU). 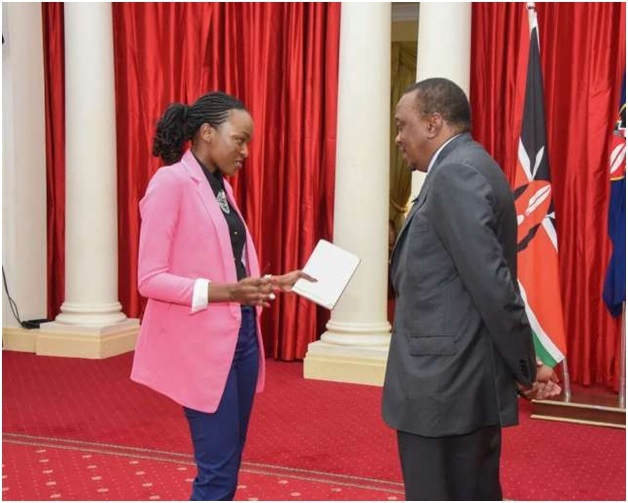 Mumbi, who previously worked for the Kenyatta family owned TV - K24, is the second journalist to leave Citizen TV for a State House job, after Kanze Dena left to become State House spokesperson. The Presidential Delivery Unit was created in 2015 to implement key projects seen to form Uhuru’s legacy. PDU is headed by Nzioka Waita, who also doubles up as Uhuru’s Chief of Staff and is a key pillar in Uhuru’s Big Four Agenda. Check out her photo below with the President.